You can download Fedora from https://getfedora.org/. There are multiple desktops available for use with Fedora. Each has a slightly different look and feel and offers varying levels of customization. You can use the Fedora Workstation image, which comes with the GNOME desktop by default, and then change your environment afterwards by installing additional packages, or you can download a spin image which will give you a different environment out of the box. Visit Fedora Spins for more information. You can also take advantage of Fedora Labs. Fedora Labs is a selection of curated bundles of purpose-driven software and content as curated and maintained by members of the Fedora Community. These may be installed as standalone full versions of Fedora or as add-ons to existing Fedora installations. Visit Fedora Labs for details. You can write all Fedora ISO images to a USB stick, making this a convenient way on any USB-bootable computer to either install Fedora or try a live Fedora environment without writing to the computer’s hard disk. You will need a USB stick at least as large as the image you wish to write. The official and supported tool to create a Fedora USB stick is the Fedora Media Writer utility, which was formerly known as LiveUSB Creator. To learn more about this application and how to use it, refer to the Preparing for Installation chapter of the Fedora Installation Guide. Fedora Media Writer destroys all data on the USB stick. If you need a non-destructive write method (to preserve existing data on your USB stick) or support for 'data persistence', you can use the livecd-iso-to-disk utility on Fedora. This method will destroy all data on the USB stick. If you need a non-destructive write method (to preserve existing data on your USB stick) and/or support for 'data persistence', you can use the livecd-iso-to-disk utility on Fedora. This method is considered unsupported. You can use it on your own risk. This method is for people running Linux, or another unix with GNOME, Nautilus and the GNOME Disk Utility installed. Particularly, if you are using a distribution other than Fedora which does not support Flatpak, this may be the easiest available method. A standard installation of Fedora, or a standard GNOME installation of many other distributions, should be able to use this method. On Fedora, ensure the packages nautilus and gnome-disk-utility are installed. Similar graphical direct-write tools may be available for other desktops, or you may use the command-line direct write method. Download a Fedora image, choose a USB stick that does not contain any data you need, and connect it. Run Nautilus (Files), open the Overview by pressing the Start/Super key, type Files, and hit Enter. Find the downloaded image, right-click on it, go to Open With, and click Disk Image Writer. Select your USB stick as the Destination, and click Start Restoring. These methods are considered unsupported. You can use them on your own risk. This method will destroy all data on the USB stick if the --format parameter is passed. You may use a non-destructive method to create the stick, meaning existing files on the stick will not be destroyed. This is less reliable than the destructive write methods, and should be used only if you have no stick you can afford to wipe. On live images, you can include a feature called a persistent overlay, which allows changes made to persist across reboots. You can perform updates just like a regular installation to your hard disk, except that kernel updates require manual intervention and overlay space may be insufficient. Without a persistent overlay, the stick will return to a fresh state each time it is booted. On live images, you can also have a separate area to store user account information and data such as documents and downloaded files, with optional encryption for security and peace of mind. By combining these features, you can carry your computer with you in your pocket, booting it on nearly any system you find yourself using. It is not a good idea to try and write a new Fedora release using the version of livecd-iso-to-disk in a much older Fedora release: it is best to only use a release a maximum of two versions older than the release you are trying to write. Ensure the livecd-tools package is installed: dnf install livecd-tools. Remember to identify your USB stick’s device name first. In all cases, you can add the parameter --efi to render the stick bootable in native UEFI mode. Detailed usage information is available by running: livecd-iso-to-disk --help or man livecd-iso-to-disk. Using the --format option in the following command will erase all data on the USB drive. This will create a 2 GiB filesystem that will be mounted as /home each time the stick is booted, allowing you to preserve data in /home across boots. Here, 2048 is the desired size (in megabytes) of the overlay. The livecd-iso-to-disk tool will not accept an overlay size value greater than 4095 for VFAT, but for ext filesystems it is only limited by the available space. Due to the way it’s currently implemented, every single change to this form of overlay, writes AND deletes, subtracts from its free space so it will eventually be "used up" and your USB stick will no longer boot. You can use dmsetup status live-rw to see how much space remains in the overlay. The output will contain something like snapshot 42296/204800, indicating that 4229 of 204800 512-byte sectors are allocated. Because of these limitations, it is advisable to use the system-level persistence sparingly, for configuration changes and important security updates only. Or, if you have sufficient disk space available, changes to the LiveOS root filesystem snapshot can be merged into a new copy of the root filesystem. You can combine --home-size-mb and --overlay-size-mb, in which case data written to /home will not exhaust the persistent overlay. This method will destroy all data on the USB stick. If you need a non-destructive write method, to preserve existing data on your USB stick, and/or support for data persistence, you can use the livecd-iso-to-disk utility on Fedora. This method directly writes the image to the USB stick much like Fedora Media Writer or GNOME Disk Utility, but uses a command line utility named dd. Like the other direct write methods, it will destroy all data on the stick and does not support any of the advanced features like data persistence, but it is a very reliable method. The dd tool is available on most Unix-like operating systems, including Linux distributions and OS X, and a Windows port is available. This may be your best method if you cannot use Fedora Media Writer or GNOME Disk Utility, or just if you prefer command line utilities and want a simple, quick way to write a stick. Identify the name of the USB drive partition. If using this method on Windows, with the port linked above, the dd --list command should provide you with the correct name. Unmount all mounted partition from that device. This is very important, otherwise the written image might get corrupted. You can umount all mounted partitions from the device with umount /dev/sdX*, where X is the appropriate letter, e.g. umount /dev/sdc*. Wait until the command completes. If you see dd: invalid status flag: 'progress', your dd version doesn’t support the status=progress option and you’ll need to remove it. In this case, you won’t see writing progress. UNetbootin may work in some cases but not others - for instance, it will likely create a stick that is bootable in BIOS mode, but not UEFI mode. Fedora cannot guarantee support for UNetbootin-written images. While your results may vary, it is usually the case that the Fedora Media Writer, livecd-iso-to-disk, GNOME, and dd methods give better results than UNetbootin. If you encounter problems with UNetbootin, please contact the UNetbootin developers, not the Fedora developers. UNetbootin is a graphical, bootable USB image creator. Using it will allow you to preserve any data you have in the USB drive. If you have trouble booting, however, you may wish to try with a blank, cleanly FAT32-formatted drive. If you are running a 64-bit Linux distribution, UNetbootin may fail to run until you install the 32-bit versions of quite a lot of system libraries. Download the latest UNetbootin version from the official site and install it. On Linux, the download is an executable file: save it somewhere, change it to be executable using chmod ugo+x filename or a file manager, and then run it. Launch UNetbootin. On Linux, you might have to type the root password. Select Type: USB drive and choose the correct device for your stick. If you do not see sdX listed, you might have to reformat the drive. You can do this from most file manager or disk utility tools, e.g. the GNOME disk utility ("Disks") on Fedora. The FAT32 format is most likely to result in a bootable stick. This will cause you to lose all data on the drive. Remove all other portable media, such as CDs, DVDs, floppy disks or other USB sticks. If the computer is configured to automatically boot from the USB drive, you will see a screen that says "Automatic boot in 10 seconds…​" with a countdown. If you do a native UEFI boot, where you will see a rather more minimal boot menu. Wait for a safe point to reboot. As the machine starts to reboot, watch carefully for instructions on which key to press. Usually a function key, Escape, Tab or Delete is to be pressed to enter the boot device selection menu, BIOS setup, firmware, or UEFI. Press and hold that key. If you miss the window of opportunity, often only a few seconds, then reboot and try again. Use the firmware, BIOS, interface or the boot device menu to put your USB drive first in the boot sequence. It might be listed as a hard drive rather than a removable drive. Each hardware manufacturer has a slightly different method for doing so. Your computer could become unbootable or lose functionality if you change any other settings. Though these settings can be reverted, you’ll need to remember what you changed in order to do so. Save the changes, exit, and the computer should boot from the USB drive. If your system has a UEFI firmware, it will usually allow you to boot the stick in UEFI native mode or BIOS compatibility mode. 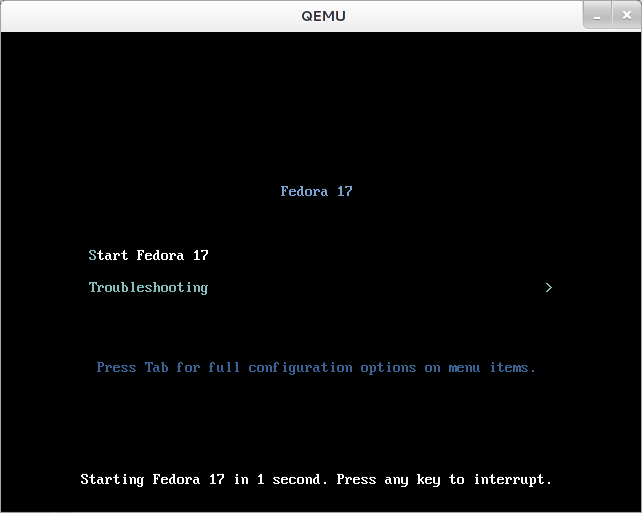 If you boot in UEFI native mode and perform a Fedora installation, you will get a UEFI native Fedora installation. If you boot in BIOS compatibility mode and perform a Fedora installation, you will get a BIOS compatibility mode Fedora installation. For more information on all this, see the UEFI page. USB sticks written from x86_64 images with Fedora Media Writer, GNOME Disk Utility, dd, other dd-style utilities should be UEFI native bootable. Sticks written with other utilities may not be UEFI native bootable, and sticks written from i686 images will never be UEFI bootable. sdX will be sdb, sdc, sdd, etc. This is the name of the disk you will use. We’ll call it sdX from now on. If you have connected more than one USB stick to the system, be careful that you identify the correct one, often you will see a manufacturer name or capacity in the output which you can use to make sure you identified the correct stick. If you get the message Need to have a filesystem label or UUID for your USB device, you need to label the partition: dosfslabel /dev/sdX LIVE. If you get this message from fdisk, you may need to reformat the flash drive when writing the image, by passing --format when writing the stick. If your test boot reports a corrupted boot sector, or you get the message MBR appears to be blank., you need to install or reset the master boot record (MBR), by passing --reset-mbr when writing the stick. livecd-iso-to-disk is not meant to be run from a non-Fedora system. Even if it happens to run and write a stick apparently successfully from some other distribution, the stick may well fail to boot. Use of livecd-iso-to-disk on any distribution other than Fedora is unsupported and not expected to work: please use an alternative method, such as Fedora Media Writer. You can test your stick using QEMU. You can use the liveimage-mount script in the livecd-tools package to mount an attached Live USB device or other LiveOS image, such as an ISO or Live CD. This is convenient when you want to copy in or out some file from the LiveOS filesystem on a Live USB, or just examine the files in a Live ISO or Live CD. To create a live image, the livecd-creator tool is used. For this, super user privileges are needed. If you are interested in localized (i.e. translated into other languages) live CD files, install also l10n-kickstarts. The configuration of the live image is defined by a file called kickstart. It can include some basic system configuration items, the package manifest, and a script to be run at the end of the build process. fedora-live-base.ks : The base live image system, included in the livecd-tools package. For Fedora 20 and earlier: fedora-livecd-desktop.ks : Complete desktop with applications and input/output support for all supported locales in Fedora. This one is part of the spin-kickstarts package. Despite the name, this is the kickstart that generates the ~1GB-sized images for recent releases. For Fedora 21 and later: fedora-live-workstation.ks. This is the Workstation product configuration. kickstart files for other spins, e.g. Fedora Electronics Lab, can be found in /usr/share/spin-kickstarts/ after installing the spin-kickstarts package. These pre-made configuration files can be a great place to start, as they already have some useful pre and post-installation scripts. 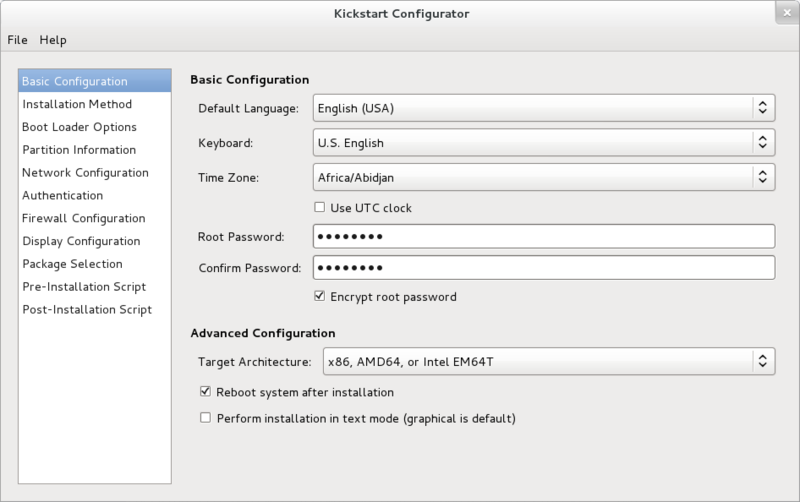 You can create a customized kickstart file by running system-config-kickstart. You might have to install the package first with dnf install system-config-kickstart in Fedora 22 and beyond or yum install system-config-kickstart in earlier versions of Fedora. This tool is mainly intended for generating kickstart files for automated installs, not live images, so the output will probably not be usable without editing, but it may help you to generate particular kickstart directives. Remember to add the line %include /usr/share/spin-kickstarts/fedora-live-base.ks at the beginning of your kickstart file to include the base live configuration. As a file system label on the ext3 and iso9660 file systems. As such, it’s visible on the desktop as the CD name. In the isolinux boot loader. If you have the repositories available locally and don’t want to wait for the download of packages, just substitute the URLs listed in the configuration file to point to your local repositories. This will create a live CD called Fedora-LiveCD using the fedora-live-workstation.ks configuration file. This will create a live CD that will boot to a login prompt. If you do not have KVM support, you have to use qemu instead. Replace filename.iso with the name of your created Live CD image and qemu-system-x86_64 with an appropriate qemu binary for the target system, e.g. qemu-system-i386. You can burn your image directly to a CD or a DVD if it fits, or you can write it to a USB stick. The live image can incorporate functionality to verify itself. To do so, you need to have isomd5sum installed both on the system used for creating the image and installed into the image. This is so that the implantisomd5 and checkisomd5 utilities can be used. These utilities take advantage of embedding an md5sum into the application area of the iso9660 image. This then gets verified before mounting the real root filesystem.